Landon, let’s have a little heart to heart, you and I. You’re awesome. 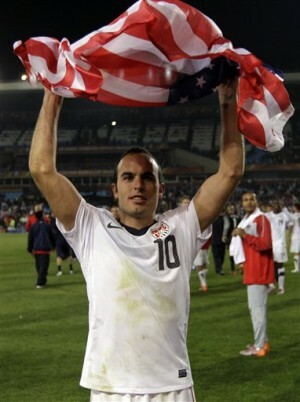 You’re the greatest American soccer player ever. Everybody loves you. But you’re wrong. Losing to Ghana is failure. A top 16 finish at the World Cup, although respectable, is failure. Especially having finished in the top eight previously, not to mention third place 80 years ago. Maybe you’re just being modest, like before. But don’t be. You beat Ghana on Saturday, and you’ll be a Uruguay or South Korea away from the semi-finals of the freakin’ World Cup. Put differently, if you can’t get through the most winnable section of the bracket (as this is), you fail. Simple as that. Win or lose, however, we’ll be cheering for you. You can do it!